Enquire or book a trip along Chợ Mới - Cần Thơ - Châu Đốc - Vĩnh Xương. Upon arrival in Chau Doc, transfer onto a local boat for the visit of a village of the Muslim Cham minority. Boarding back at noon, with a welcome drink. Departure upstream river Bassac. Lunch is served while en route. 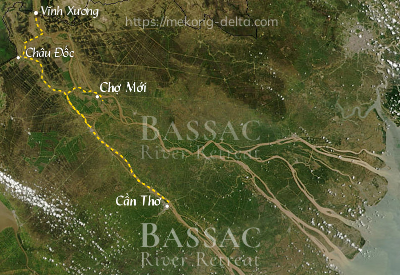 In the middle of the afternoon, the Bassac casts anchor on the Tan Chau canal for the visit of a village. Wooden ship yards, rice fields. Boarding back by late afternoon. Dinner is served as the Bassac resumes her journey on the canal towards the first stream of the Mekong. The Bassac drops anchors for the night on the Tien Giang river, in front of Tan Chau. Breakfast is available from 6:30 AM, as the Bassac casts off upstream the Mekong in the scenery of the banks. Arrival at the Vinh Xuong frontier post at about 8:00. Check-out. End of services by mid-morning on shore at Vĩnh Xương. Upon disembarking, you may transfer to a speedboat heading towards Cambodia and Phnom Penh. This leaves you ample time to have a solid breakfast, and still be on shore at lunch time, after about 4 hours, right in the middle of Phnom Penh on the Sisowath pier. A very practical and fast access to Cambodia. You may need to charter a speedboat to effect this journey, but you can even make your visa to Cambodia at the frontier.